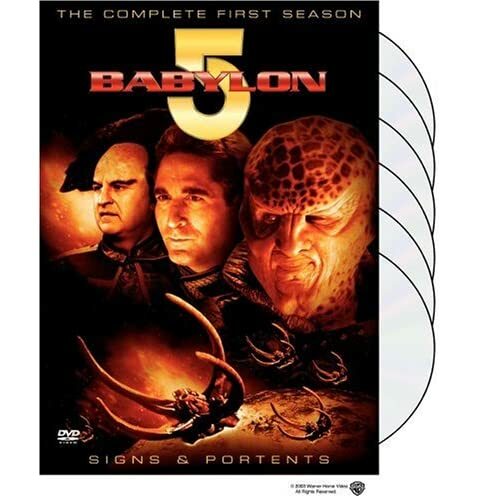 The epic sci-fi series Babylon 5 was a unique experiment in the history of television. It was effectively a novel for television in five seasons, consisting of 110 episodes with a clear beginning, middle, and end. The first season introduces the main characters, headed this year by Commander Jeffery Sinclair (Michael O'Hare) and Security Chief Michael Garibaldi (Jerry Doyle), and familiarizes the audience with the unique environment of a five-mile-long space station in the year 2257. The first episode, "Midnight on the Firing Line," plays at a breathless pace, introducing Commander Susan Ivanova (Claudia Christian) and establishing the conflict between the Narn and Centauri races as represented by their ambassadors, G'Kar (Andreas Katsulas) and Londo Mollari (Peter Jurasik). Then follow several mediocre episodes that initially give the impression that B5 is a Star Trek clone afflicted with "silly alien of the week" syndrome. With "And the Sky Full of Stars," B5 really begins to hit its stride, Sinclair being forced to relive his mysterious experiences during the Earth-Minbari war. Filler shows such as "TKO" are notable only for being controversially violent, while the disappointing "Grail" points to writer-creator J. Michael Straczynski's fascination with Arthurian mythology. "Signs and Portents" introduces the sinister Mr. Morden (Ed Wasser) and offers the chilling first appearance of the Shadows, an ancient alien threat. B5 hits warp speed with a run of exceptional episodes building to the season finale. The two-part "Voice in the Wilderness" has Mars breaking into open revolt against Earth and the discovery of a "Great Machine" on the dead world Epsilon 3. Referencing 1950s sci-fi classic Forbidden Planet, the story leads to the superb time-travel-based "Babylon Squared." Season finale "Chrysalis" proves more than just the usual television cliffhanger, placing Minbari ambassador Delenn in conflict with her ruling Grey Council and forcing on her a decision that laid the groundwork for Babylon 5's eventually becoming a great love story.